The bell tower of "la Vila", is one of the symbolic and identifying references of the city. It is worth doing the guided tour on Sunday mornings to see from the top, the panoramic view of the "Vall d'Albaida" and the "Sierra de Mariola". 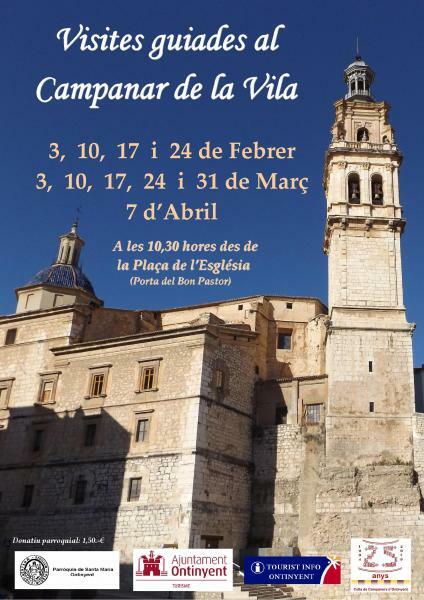 The "Colla de Campaners" has organized from February to April, visits every Sunday at 10:30 am, being the starting point the "Plaça de l'Esglèsia" (Porta del Bon Pastor). The month of February, days 3, 10, 17 and 24. - The month of March, on days 3, 10, 17, 24 and 31. - And the month of April on the 7th. *Previous registration is not needed. Punctuality is required.